I've been to York Redoubt (et al) several times over the last few months. If you haven't found them yet, there are pictures in the database. The YR pics, among others, are posted on my blog as well. Just wondering, Why is the York Redoubt page only open to full members? 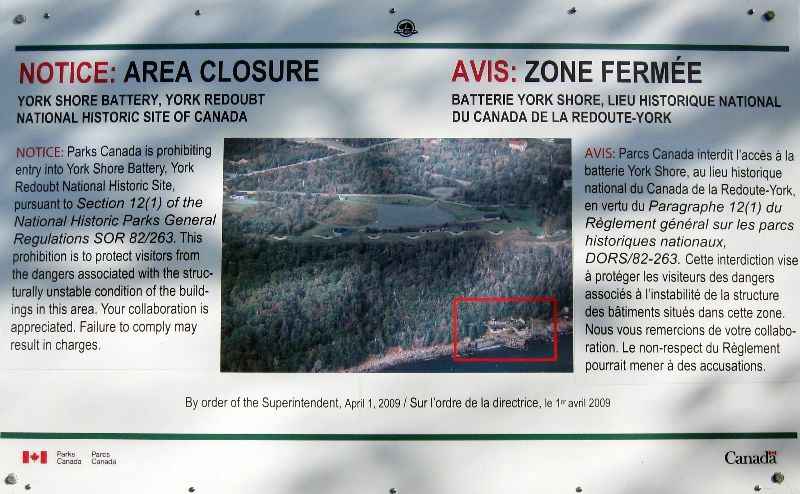 There are places at York Redoubt that aren't open to the public that have been infiltrated over the years. We've discussed de-amalgamation in the past and decided not to. In the meantime, I'm going to separate the public from the private so we can open most of it up. Edit: Cancel that. I'm not able to separate it as well as I'd like. I'm going to have to leave it as it is. Ahhhhh darn thats too bad, thanks for trying though. I was guessing that was the problem. Maybe it should be a location of its own. There are tunnels and buildings that are bigger obstacles in de-amalgmation. I sent you a PM to prevent you from potentially harming yourself. Any interest in a coordinated visit? I saw you on the news last night! On an even more unrelated note: I saw you on the news last night! Oh snap! Been outed as a union activist! hahahaha, Me=doofus! Should have looked first. See, normally the George's Island tour is an offshoot of "The Great Offshore Picnic", an initiative of the oil industry. I foolishly took it for granted that it would be the same time this year. It turns out that the picnic isn't happening at all this year, because the DNR is doing too much work restoring the island. Which does bode well for future access, but does mean no visit for us. I'm doing a camping trip to McNabs during my week off. ...which takes place during the week of..? April the 31st of March! This page was generated for you in 156 milliseconds. Since June 23, 2002, a total of 574160532 pages have been generated.